The latest National Survey of Children’s Health finds that 15.8% of U.S. youth ages 10 to 17 have obesity. West Virginia has the highest adult obesity rate, 38.1%, according to the latest Behavioral Risk Factor Surveillance System. Nationwide, 18.5% of youth ages 2 to 19 have obesity, according to the latest National Health and Nutrition Examination Survey. The rate of obesity declined from 15.9% in 2010 to 14.5% in 2014 among 2- to 4-year-olds enrolled in the Special Supplemental Nutrition Program for Women, Infants, and Children (WIC). 14.8% of U.S. high school students have obesity and an additional 15.6% are overweight, according to the latest data from the Youth Risk Behavior Surveillance System. The vast majority of TV food ads targeting Black and Hispanic audiences are for unhealthy products. A new report shows what impact that could have on health disparities. Schools play an important role in helping kids lead active, healthy lives. The elementary schools that are making it a priority to help students get at least 60 minutes of daily activity can show others how to do the same. Nearly 100 advocates, nutritionists, researchers, Congressional staff members and others gathered on Capitol Hill for The State of Obesity 2018 Congressional Briefing in late February. Physical activity can help children and adults reap widespread health benefits. The Safe Routes to School National Partnership produces a 50-state scan examining how state policies support or hinder walking and biking in communities and the school setting. Jamie Bussel and Victoria Brown, RWJF Program Officers, talk about the first-ever U.S. Access to Nutrition Index. 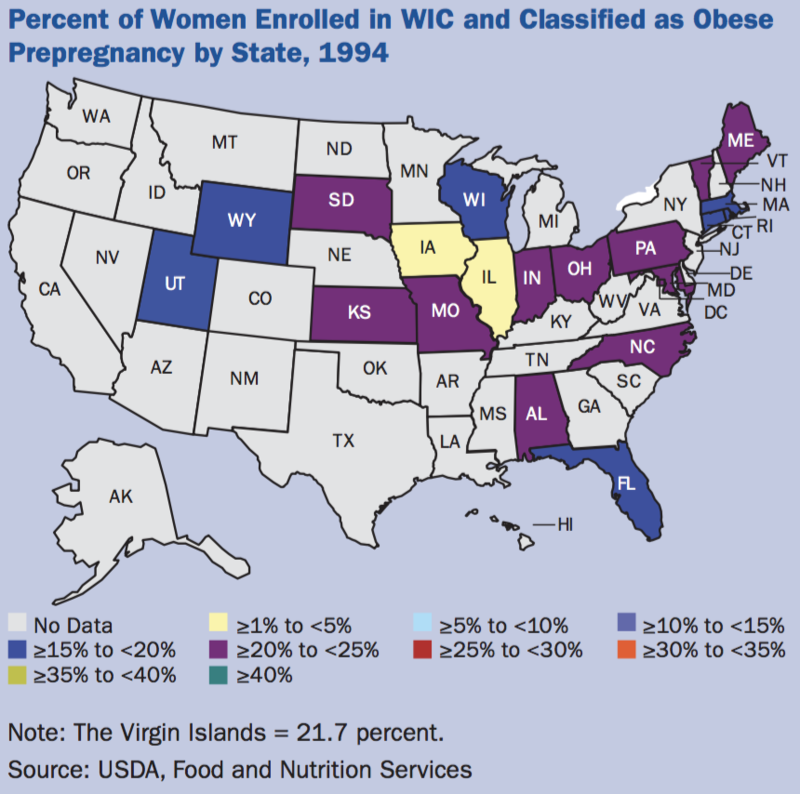 The rate of women who were obese before becoming pregnant and participating in the WIC program has dramatically increased over the past 20 years, increasing 86 percent from 19.2 percent in 1994 to almost 36 percent in 2014.3,4 In 1994, the rates ranged from a low of 1 percent in Iowa to a high of 24.7 percent in Vermont. Good prenatal healthcare is important to help reduce risks and complications. Many experts, however, now believe that much of prenatal care, which usually begins during the first three months of pregnancy, comes too late to prevent many serious maternal and childhood health problems. Even the first few weeks after conception are critical for healthy fetal development. Medical professionals recommend an increased focus on regular well-care and preventive healthcare for women throughout childbearing age, including screening for risk of obesity and related chronic health conditions. 1 Osterman MJK, Martin JA, Curtin SC, et al. 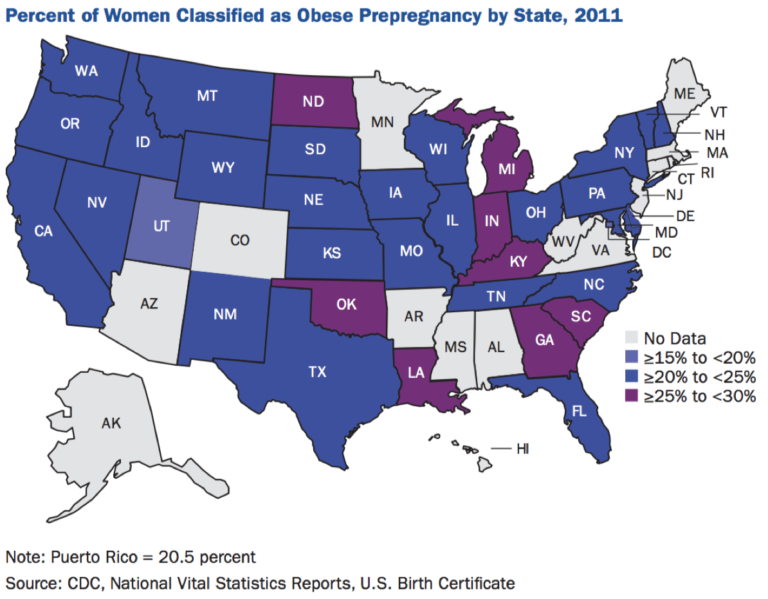 Newly released data from the revised U.S. birth certi cate, 2011. National Vital Statistics Report 62(4), 2013. Hyattsville, MD: National Center for Health Statistics. 2 Agency for Healthcare Research and Quality. (2010). One in 16 Women Hospitalized for Childbirth has Diabetes. [News Release] (accessed October 2014). 3 Randall B, Boast L, Holst L. Study of WIC Participant and Program Characteristics, 1994. Alexandria, VA: U.S. Department of Agriculture, Food and Nutrition Service, Of ce of Analysis, Nutrition and Evaluation, 1995. 4 Thorn B, Tadler, C, Huret C, et al. 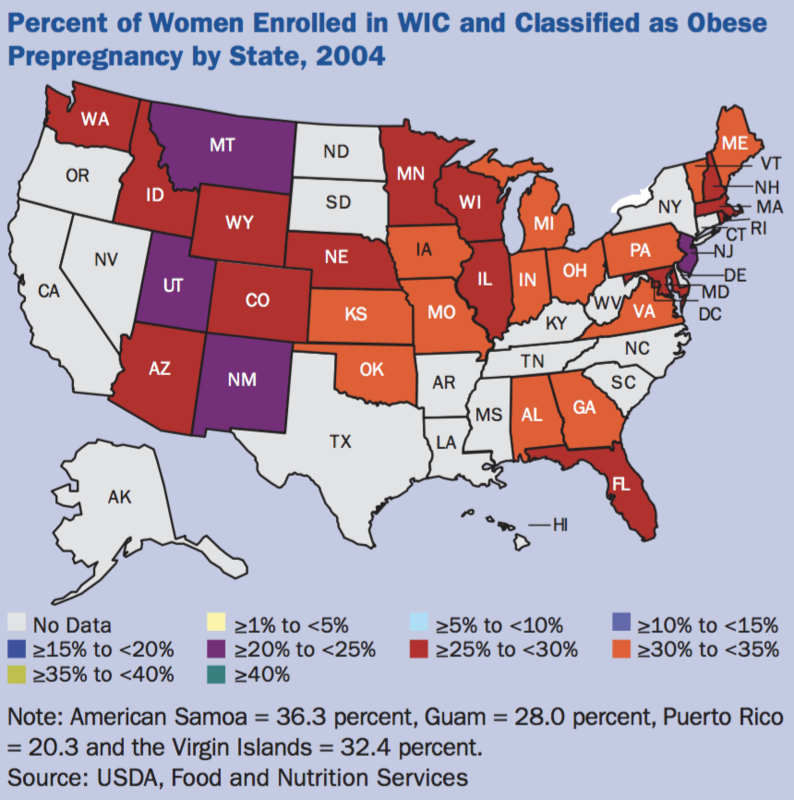 Study of WIC Participant and Program Characteristics, 2014. Alexandria, VA: U.S. Department of Agriculture, Food and Nutrition Service, 2015. 5 Randall B, Barlett S, Kennedy S. Study of WIC Participant and Program Characteristics, 2004. Alexandria, VA: U.S. Department of Agriculture, Food and Nutrition Service, Of ce of Analysis, Nutrition and Evaluation, 2006. 6 Thorn B, Tadler, C, Huret C, et al. 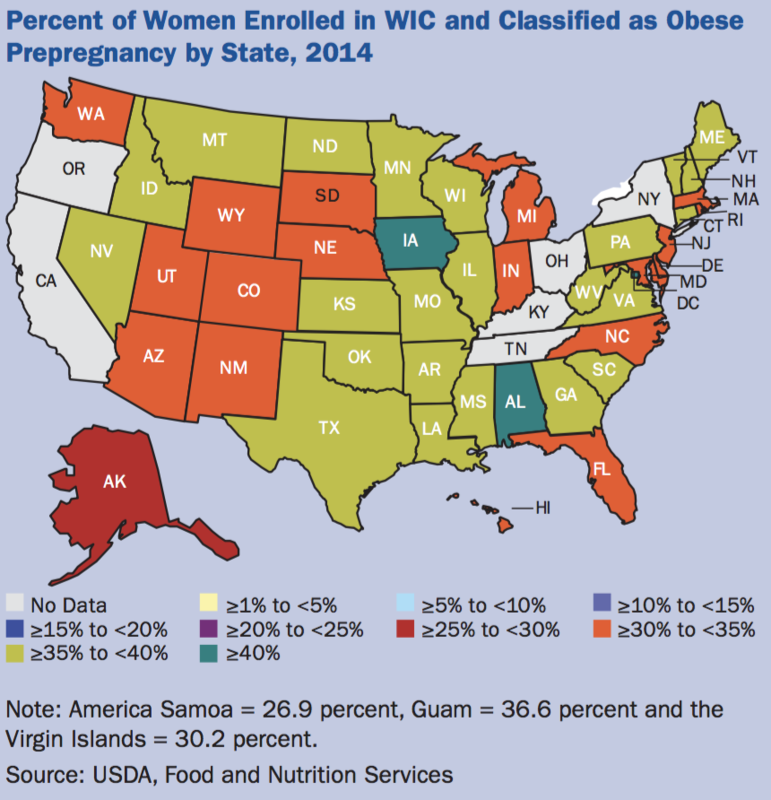 Study of WIC Participant and Program Characteristics, 2014. Alexandria, VA: U.S. Department of Agriculture, Food and Nutrition Service, 2015. 7 Chen Y, Quick WW, Yang W, et al. Cost of Gestational Diabetes Mellitus in the U.S. in 2007. Popul Health Manag 12(3): 165-174, 2009. 8 Frequently Asked Questions: Nutrition During Pregnancy. In The American College of Obstetrics and Gynecologists, 2015 (accessed May 2016). 9 Institute of Medicine. Preterm Birth: Causes, Consequences, and Prevention. Washington, D.C.: The National Academies Press, 2007 (accessed October 2014). 10 Prematurity Campaign. In March of Dimes (accessed October 2014). 11 Infant Health. In Centers for Disease Control and Prevention (accessed May 2016). 12 OECD. OECD Health Data: Health status: Health status indicators, OECD Health Statistics (database) (accessed May 2016). 13 OECD. Health at a Glance: OECD Indicators. Paris, France: OECD Publishing, 2015 (accessed May 2016). 14 AAP Reafirms Breastfeeding Guidelines. In American Academy of Pediatrics, 2012 (accessed June 2015). 15 Breastfeeding Initiatives: FAQ. In American Academy of Pediatrics (accessed June 2015). 16 Institute of Medicine. Early Childhood Obesity Prevention Policies. Washington, D.C.: National Academies Press, 2011 (accessed June 2015). 17 National Center for Chronic Disease Prevention and Health Promotion. Breastfeeding Report Care. 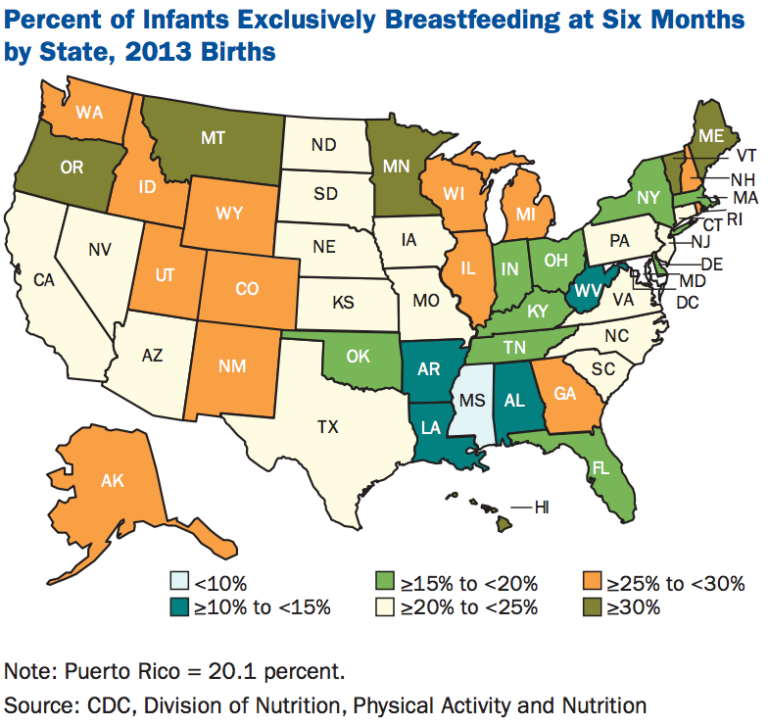 Progressing Towards National Breastfeeding Goals, United States, 2016. Atlanta, GA: Centers for Disease Control and Prevention, Division of Nutrition, Physical Activity, and Obesity, 2016 (accessed August 2016). 18 Yan J, Liu L, Zhu Y, et al. The association between breastfeeding and childhood obesity: a meta-analysis. BMC Public Health, 14:1267, DOI: 10.1186/1471-2458-14-1267, 2014 (accessed July 2016). 19 Young BE, Johnson SL, and Krebs NF. Biological determinants linking infant weight gain and child obesity: current knowledge and future directions. Adv Nutr, 3: 675-686, 2012. 20 Ip S, Chung M, Raman G et al. Maternal and Infant Health Outcomes in Developed Countries. Evidence Report/Technology Assessment No. 153. AHRQ Publication No. 07-E007. Rockville, MD: Agency for Healthcare Research and Quality, 2007. 21 Stuebe A. The risks of not breastfeeding for mothers and infants. Rev Obstet Gynecol 2(4): 222-231, 2009. 22 Neville CE, McKinley MC, Holmes VA, et al. The relationship between breastfeeding and postpartum weight change?a systematic review and critical evaluation. International J Obs 38: 577-590, 2014. 23 Jarlenski M, Bennett WL, Bleich WN, et al. Effects of breastfeeding on postpartum weight loss among U.S. women. Prev Med, 69: 146-150, 2014. 24 Centers for Disease Control and Prevention. (2013). U.S. breastfeeding rates continue to rise. [Press Release] (accessed June 2015). 25 Bener A, Ehlayel MS, Alsowaidi S, Sabbah A. Role of breast feeding in primary prevention of asthma and allergic diseases in a traditional society. Eur Ann Allergy Clin Immunol, 39(10): 337-343, 2007. 26 Bener A, Hoffmann GF, A fy Z, et al. Does prolonged breastfeeding reduce the risk for childhood leukemia and lymphomas? Minerva Pediatr, 60(2): 155-161, 2008. 27 Hauck FR, Thompson JMD, Tanabe KO, et al. Breastfeeding and Reduced Risk of Sudden Infant Death Syndrome: A Meta-analysis. Pediatrics, 128(1): 103-110, 2011 (accessed June 2015). 28 AAP Reaf rms Breastfeeding Guidelines, 2012. 29 Sacker A, Kelly Y, Iacovou M, Cable N, Bartley M. Breast feeding and inter-generational social mobility: what are the mechanisms? Arch Dis Child, 98(9): 666-671, 2013 (accessed June 2015). 30 The JAMA Network, (2013). Breastfeeding Duration Appears Associated with Intelligence Later in Life. [Press Release] (accessed June 2015). 31 Chowdhury R, Sinha B, Jeeva Sankar M, et al. Breastfeeding and maternal health outcomes: a systematic review and meta-analysis. Acta Paediatrica 104(s467): 96-113. 32 Perrine CG, Nelson JM, Corbelli J, et al. Lactation and maternal cardio-metabolic health. Annu Rev Nutr, 36(627-645), 2016 (accessed August 2016). 33 The burden of suboptimal breastfeeding in the United States: a pediatric cost analysis. Pediatrics, 125(5): e1048-e1056, 2010 (accessed August 2016).